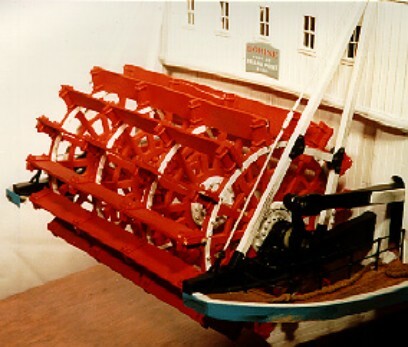 This model is an original scratch project that attempts to capture the essence of the sternwheel packet steamboat as found on the American western rivers during the latter part of the nineteenth century. This generic creation DORINE, named after the modeler's daughter, combines many of the best architectural features as seen through the eyes of the modeler, as well as embodying his efforts to create a few impressions, most notably the decorative gingerbread and hand carved ornamentation. While the matter of what constitutes the best architectural features is indeed arguable, most steamboat aficionados would agree that no subject better captures the imagination and spirit of America's maritime heritage than these wonderful old boats belching and churning their river magic! The modeler's desire to create an original work was driven in part by the limited number of steamboat subjects for which plans are available. The project has taken approximately 6400 hours of spare time to complete from inception, spanning 8 years, 1987-95. Much has been written about the lore and romanticism of the steamboat. These colorful old boats plied the Mississippi River and its tributaries for much of the 19th century and early 20th century until the automobile, railroads, and modern communications forced them out of business. The riverboat evolved primarily to meet the need of the early pioneers who settled in the Midwest for consumer goods and, to a lesser extent, theatrical entertainment. The latter was provided by the well-known showboats, the romance and nostalgia of which has been greatly perpetuated by songs, books, and Hollywood. The sole means of bringing this sort of entertainment to the hundreds of riverfront communities founded by the pioneers was with mobile playhouses - showboats! However, traffic of this type was not as prevalent as the lesser-known sternwheel packet boats that carried passengers and cargo. Surprisingly, there are very few authentic drawings available from which the original packets had been built. Research shows that they were usually built without plans, unlike today's boats, designed by trained naval architects. These vessels of the 1800s were designed and built by experienced craftsmen who relied on skill, intuition, and "rake of eye" to weave their incomparable symmetry and magic. 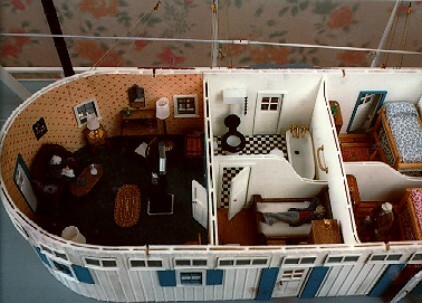 It is sincerely hoped that this modeler's attempt to be as creative, will please, if not delight viewer. BS Degree, US Merchant Marine Academy, Kings Point; MS Degree, Stevens Institute of Technology, Hoboken; Business Courses, Wharton Business School, NY. USCG Licensed Captain, steam or motor vessels up to 100 Gross Tons, including towing. Employed 1966-97 by Exxon Company International, Supply & Transportation Department, Ship Operation and Engineering Executive. Foreign assignments in Japan, Taiwan, Germany, Singapore and England. Served two years active duty as Lieutenant, US Navy. Served one year Third Assistant Engineer in Merchant Marine, including service aboard SS United States. Extensive travel to over 80 countries. Inspired to ship modeling by his grandfather, Nick’s modeling philosophy is to build models that reflect a part of America’s maritime heritage. He has written numerous magazine articles. Ship modeling activities have been the subject of several newspaper articles. Given talks on a wide variety of ship modeling, maritime and radio control subjects. Has given ship modeling courses. A frequent speaker at club functions. 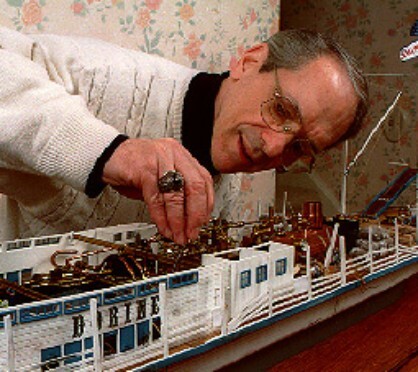 President Emeritus of the Ship Model Society of Northern New Jersey. Television appearance in Singapore as founder of the Singapore Ship Model Club. Speaker at the 2000 World Marine Millennial Conference, the 1989 and 1998 Nautical Research Guild Conferences and at other exhibits and conferences. Member of NRG ship model builder’s advisory network. Author of research papers for the NRG Journal and Model Shipwright. Book reviewer for NRG Journal. His paper on the sinking in 1865 of the ill-fated side-wheeler Sultana has gained national exposure. 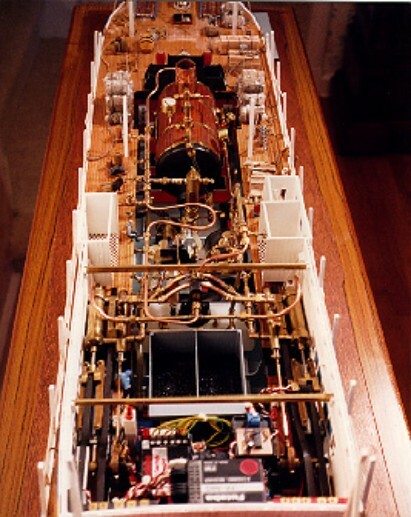 Ship models, particularly the Dorine and USS New Jersey, have won numerous show awards including several “Best of Show.” Dorine, a generic creation depicting a sternwheeler packet steamboat circa 1870, is replete with a working miniature steam power plant. It was a medal winner at the Mariners’ Museum 1995 Exhibition & Competition. His museum-quality model of the USS New Jersey, his second, is displayed on board the vessel at Camden, New Jersey, as part of the museum exhibit. Lives in Short Hills, NJ. Other interests include boating on his 43 foot cabin cruiser Mon Tresor II, physical fitness, volunteer work at VA Hospital, acting, Mercedes-Benz Roadster show car, travel, softball and World War II and US Civil War history. Emphasis has been placed on trying to achieve authentic detail throughout. Except for some manufactured items such as chain, cordage and some of the power plant components, the model is entirely scratchbuilt. The model, in 1/4" scale, is replete with a working steam power plant. The main throttle valve affords control from "Full Ahead" to "Full Astern". Other special features include the use of real glass for ports and windows, 1500 pieces of hand laid deck planking, several furnished cabins, 22 operational "sight and sound" functions, photo-etched appointments throughout and a paddlewheel of 1747 hand crafted parts that are assembled in the same way as a full scale paddlewheel. The superstructure is modularized and can be disassembled for ease of maintenance and repair of working parts. The aft portion of the Texas cabin roof is removable to enable viewing of the furnished cabins, one of which has running water in the washroom. The pilothouse roof is removable to enable viewing of the fully furnished pilothouse. The entire superstructure is removable for engine room viewing.